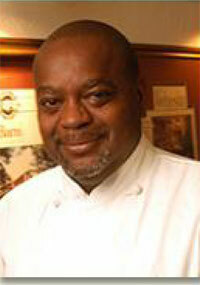 Chef Walter Royal, Jr. was born on May 18, 1957 in Eclectic, Alabama to Ida Mae and Walter J. Royal. At the age of fourteen, Royal knew he wanted to cook professionally. However, his parents dissuaded him, unsure of how successful he would be as a black chef. In1974, Royal attended LaGrange College in LaGrange, Georgia, where he graduated with his B.S. degree in psychology. In 1980, he graduated from Auburn University with his M.S. degree in psychology. After working with mentally disabled children for five years, Royal enrolled in a nine-month program at Nathalie Dupree’s Cooking School in Atlanta, Georgia in 1983. After graduating from the cooking program, he was hired as a sous-chef at the Fearrington House restaurant in Pittsboro, North Carolina. There he worked under acclaimed chef Edna Lewis. In 1986, Royal was hired as a chef at the Magnolia Grill in Durham, North Carolina before becoming the executive chef and co-owner of the Crescent Café. In 1995, Royal was hired as the executive chef of the award-winning steakhouse The Angus Barn in Raleigh, North Carolina. Royal has won numerous culinary awards. In 1997, he was the first African American chef to be awarded the Restaurant Guild’s Five Star Chef of the Year. Royal was also deemed one of the James Beard Foundation’s Rising Stars along with being honored as one of the Top Five Chefs in the Southeast, the Top Black Chef in America and the Best Chef in the Triangle region of North Carolina. Royal was featured in Southern Living magazine. In addition to being featured in Ebony, Royal performed a cooking demonstration in Raleigh, North Carolina on the CBS Network program The Early Show. In 2006, Royal competed on the Food Network reality cooking show, Iron Chef America . Royal has cooked with popular American chefs and television personalities like Bobby Flay, Guy Fieri and Cat Cora. In 2010, he was awarded an honorary doctorate from Johnson & Wales University in Providence, Rhode Island. Royal has one son, Walter Royal, Jr.